On the left of this photo is an ornate building which Michael thinks he identifies as the Unitarian Baptist Chapel. Can anyone help confirm the identity of the building? its looking much more like a pub than a church. I wonder what the road is that meets Church Street here, that could be a clue. Also which side of the road? Is that an entrance into Crossfield Street on the left of the picture? Also what are the tall buildings in the foggy background? They suggest that the buildings in the picture are on the Creek side of Church Street and the two towers may be large Creek side warehouses or mills? I agree, Shipwright's Palace, having now seen the building from the front, it does have the distinct look of a pub. The buildings are on the West side of Church Street, and the street from which the picture is taken is Pender Street. Church Street runs roughly South-North, and so the camera view is roughly South-West. The buildings in the background are probably those in the High Street. Having looked again at the map of 1914, the Unitarian Baptist Chapel is further down Church Street, opposite Berthon Street. It was a detached building, laying back from the street, and had St Paul's behind it. The recreation ground mentioned earlier was between St Paul's and the chapel. Looks like the building in question was a pub, then, but neither the 1914 map nor the directory shows it. Albury Street??? I remember as a kid walking past the newsagents 'Maynards' as I knew it and then about 100yds further going through the gate into St Paul's then into the wreck that use to be there, but cant for the life of me remember a Pub there. It is on the west side of Church Street. Just above the doorway where the two men are standing, there appear to be the words `Shoe Repairs'. This could, then, be No. 181 Church Street, where William Wright, boot & shoe maker had his shop. Judging from the roughly painted sign, I think he just used part of the building. Thanks for your help on this matter. I can now confirm the address numbers shown in the photo are 171-179 Deptford Church Street. I do not know if the ornate building is included. The photo was taken in 1946/7. Was the Chapel still there then? I've looked in the London Metropolitan Archives for non-conformist churches, hoping the registers of births, marriages and deaths would give some indication of the time-span of the Unitarian Baptist Chapel, but could not find it listed. Looks like a visit to the local history centre is necessary. Before Mr. Webster owned the King's Head Pub at #199, my ancestor's The Salter's owned the Kings Head. I should also add that Richard Thomas Salter, my great-great-grandfather owned the King's Head from 1881-1898 from what I've been able to discern. The ornate building on the right of the photo is No 181 Church St, which was occupied by my Grandfather, William Alfred Wright, and his family. He was a Master Shoe Repairer. He died in 1946 and my father, Reuben Arthur, took over the business. We lived above the shop on the 1st floor, the top floor was rented to another couple. The signage on the shop window says that the business was established in 1879, having moved from Creek Rd. The gap at the left of the photo is the start of St Paul's Churchyard. The building was demolished c 1972 when my parents and brother moved to Grove Park. I left in 1970 when I got married. The street opposite is indeed Pender St.
You cannot imagine my excitement at my husband coming across a website dedicated to the History of Old Deptford. 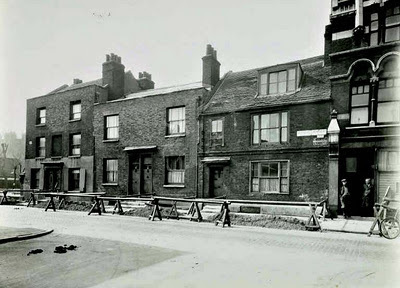 My family lived at number 177 Deptford Church Street from 1948 to 1983 when Lewisham Council compulsory purchased our family home (for below the market value at that time) to make way for the dual carriageway that is now in place. From my bedroom window I could see the mast of the cutty sark plus the clock tower in Greenwich. There was a spiral staircase leading up to the top floor, my dad put a new staircase in for the bottom stairs together with a bathroom. The house had six rooms altogether and it was kept spotlessly clean. I went to Grinling Gibbons infant and John Evelyn Junior schools. My brother went to the senior boys school that was in Creek Road can’t remember the name of the school now. I was christened in St. Paul’s church and also married there in 1972. I was one of the first to join the new youth club in the crypt when it was converted. I remember my mum telling me that some of the men who were clearing the crypt of caskets contracted lead poisoning. As a young girl I used to go to the rec which, was behind our house in Church Street it was a safe place to be, as there was a lady attendant who would monitor who was coming into the playground also, if you injured yourself she would dress the cut with a plaster “Good Old Days”! I remember Albury Street being cobbled and the magnificent Grinling Gibbons carvings that all the houses had by their front door that was until the council decided to improve the look of the houses (the sad thing was that the original carvings were never put back; the carvings that are in place now are a poor substitute). One saving grace is that the houses that were privately owned still have the original Grinling Gibbons carvings. Does anyone know what happened to the other carvings? Where did they end up! I also seem to remember that a film was being shot in Albury Street in the sixties can’t remember what it was about though. There was a pub at the end of Albury Street and I am sure it was called the Kings Head; together with the old site of The Albany. I used to know Eddie Pearce who lived in Mary Ann Buildings. I also remember that Pickford’s had a Removal Yard together with the Salvation Army Hall in Mary Ann Buildings. My old neighbours were; 175 Church Street Henrietta & Henry together with their son Harry and his daughter Dianne. We Lived at 177 Church Street Caroline (Carrie) & William (Bill), William (Billy) & Linda. 179 Church Street Downstairs Lottie (Charlotte) & Len (owned the green grocer shop opposite). Upstairs: Ann & Roy together with their son Roy. 181 Church Street when I lived there was indeed a shoe repairer. I also remember that the Gray’s owned the sweet shop as I used to play with their son Clive. Can anyone remember behind the pawn shop there was an alleyway (square) with a few houses can anyone remember the name of the turning?? I know the houses were demolished some time ago. I used to go to Saturday morning pictures at the Odeon; it used to be at the top of Church Street (Broadway end) on the right hand side. I used to look forward to Saturday morning pictures with Old Mother Reily and Lassie etc., there would be demonstrations on how to do tricks with yo yo’s and any other craze that was fashionable at the time. Deptford High Street was great it had all the shops you could possible want from Rozies ice cream parlour, Mark and Spencer, David Greggs, Tesco supermarket, Fantos, Woolworths, Brilliant Fish and Chip shop and a lovely family bakers opposite the pie and mash shop. When I lived in Deptford it was a great place to be, the people were friendly and would look after each other, the doors were never locked and neighbours would drop in for a cup of tea and a chat. The greatest regret is that the council was allowed to destroy a whole community. I remember the wonderful houses that were pulled down including our family home. The people were proud of their homes the doorsteps and windows would be cleaned every week; my mum used to leave 1s 6d on the top window sill for the window cleaner. I was born in Deptford Church Street and my great grandmother also lived there , many happy memories and still live in Deptford althou changed alot now . does anyone remember the Granger family...they lived at 33 Church Street. My grandmother was born there in 1942......they lived there for quite some time and I'm trying to track down a photo of the house as a little surprise project for her. Thank you in advance. Re: post from Anonymous in Sept 2012 from someone who lived at 177 Church Street. I found this post whilst doing some family research for my wifes father, who is Harry (the son who lived at 175 Church Street). Harry Was delighted to read all about his old neighbours and was amazed to see the picture of his family home.